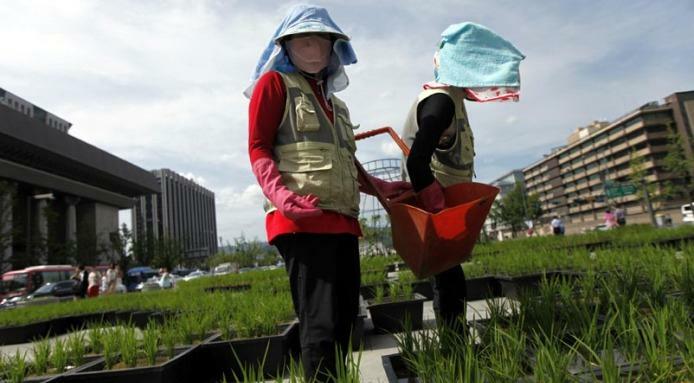 Seoul South Korea has declared 2012 to be the beginning of Urban Agriculture in the city. To build a foundation for this movement the city has invested nearly $5.7 million dollars, which will foster the transformation of 1% of the city’s land into productive agricultural land. The urban agricultural movement, which is growing in popularity around the world has many potential benefits for people, our cities and the natural environment. Agriculture use to be one of the largest forms of employment in the USA. Today after 60 plus years of industrialized agriculture farming employs around 2%-3% of US citizens. Compare this to the 50% of the population agriculture employed in the 1870’s (blm.gov/opub…). While I think the majority of people would say that they do not want to return to an 1870’s life style they would also agree that we do need to consider any option available to help increase employment and reduce unemployment. Urban agriculture is one such opportunity. Because it relies on human labor inputs rather than the machine oriented labor inputs of industrialized agriculture this production paradigm is inherently an ideal human labor or employment generator. Another benefit of urban agriculture is the impact it can potentially have on the build urban landscape. As noted in this particular instance Seoul will focus on developing vacant – unused parcels of land into ‘green agricultural zones’ (City Farmer News). The most obvious and direct benefit from this is turning what is so often a blight in the urban landscape (undeveloped, degraded, and polluted land) into a more aesthetically appealing and productive landscape. This in an of itself is a major benefit to any city that has to deal with large parcels of unused land, which most do. In addition to this urban agriculture also has the potential to benefit cities in other ways as well. For example developing unused lands and even rooftops into urban agricultural spaces can dramatically reduce the urban heat island effect through the reduction of albedo and emissivity (solar reflectivity and stored solar heat emissions respectively) (wikipedia). Urban agriculture can also have beneficial effects on the natural environment as well. An excellent example of potential benefits to both the urban and natural landscape would be the mitigation of stormwater through both the use of rainfall and runoff in urban agricultural areas thus dramatically improving the impacts of stormwaters pollutive and erosive effects where the urban and natural water systems meet. The most obvious examples of the potential benefit to the natural landscape would be the reduction of agricultural sprawl, soil degradation, water and soil pollution and of course climate change. All in all the development of a strong urban agricultural movement obviously has many inherent benefits and very few potential harmful impacts. South Korea has rapidly become one of the most advanced and progressive nations in the world in terms of general development and quality of life for its citizens. This promotion of urban agriculture in their largest urban area serves as an excellent model for the rest of the world and hopefully will help to promote our own urban agricultural movement here in the USA.